The area of the Grange Estate probably changed very little for many centuries until Parliamentary enclosure in the early Nineteenth Century. The Estate was littered with archeological sites, most of which were excavated prior to gravel extraction. 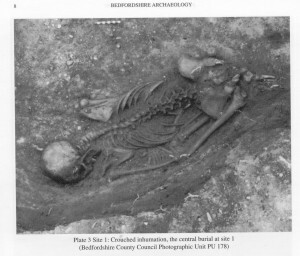 They included a Neolithic female burial dating from around 3,000BC within a rectangular enclosure, Bronze Age round barrows (burial mounds) of about 1,700BC, several Iron Age enclosures and Roman cremation, enclosure and ditches. Before enclosure the area was partly common arable field and partly permanent meadow adjoining the river. In the mid to late Twentieth Century, huge changes occurred. Many local people will remember the plantations of poplar by Bryant and May at the end of the 1950s. Intended for use as matchsticks, the trees were later cleared for the gravel extraction that started in the 1980s.